Dr. Chugay is nearly animated in his enthusiasm and excitement over Orange County’s never-ending search for the perfect body – its definition changing as frequently as the local traffic patterns. More and more of Dr. Chugay’s patients are seeking the latest in cosmetic surgery – buttock and calf implants. In fact, the American Academy of Cosmetic Surgery, based in Newport Beach, reports that the demand for breast augmentation increased 11.5 percent in 1989. “Now we’re seeing the demand for all-around body sculpting escalate accordingly,” he says. As one of the few local cosmetic surgeons practicing the popular new techniques, Dr. Chugay has sparked national interest in the procedures. 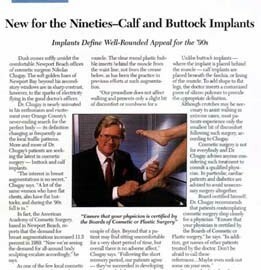 The buttock implants comprised a silicone-gel filled membrane which slides underneath the gluteal muscle. The clear round plastic bubble inserts behind the muscle from the waist line, not from the crease below, as had been the practice in previous efforts at such augmentation. 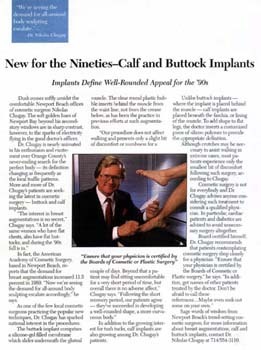 In addition to the growing interest for tush tucks, calf implants are also growing among Dr. Chugay’s patients. Unlike buttock implants – where the implant is placed behind the muscle – calf implants are placed beneath the faschia, or lining of the muscle. To add shape to flat legs, the doctor inserts a customized piece of silicon polymer to provide the appropriate definition. Although crutches may be necessary to assist walking in extreme cases, most patients experience only the smallest bit of discomfort following such surgery, according to Chugay. Cosmetic surgery is not for everyone and Dr. Chugay advises anyone considering such treatments to consult a qualified physician. In particular, cardiac patients and diabetics are advised to avoid unnecessary surgery altogether. Sage words of wisdom from Newport Beach’s trend-setting cosmetic surgeon; for more information about breast augmentation, calf and buttock implants, contact Dr. Nikolas Chugay at 714/554-3110.